This is one of the saddest things that can happen to a knitter. See that tiny little ball of yarn up in the right corner? That's all that is left. I'm not going to make it to the end. I'm not even close (and I haven't even done the thumb on the first mitt). This is all the yarn I have. Stephanie Pearl McGee wrote in one of her books that the risk of a knitter running out of yarn in a given project is inversely related to the difficulty it would take to acquire more yarn. If the yarn came from the big box store down the street and they had a ton of it, you could be certain you wouldn't run out. Yarn that came from your local yarn store and they were holding an extra bag for you? You were definitely good. But you were sure to run out of the yarn you bought from a small local coop on a once in a lifetime trip to Italy, no matter how many extra skeins you purchased. That's more or less my experience here. The pattern (which I highly recommend as a fantastic quick knit that leaves you with fingerless mitts you will not want to take off because of their coziness) assured me that I only needed 1.2 ounces of DK weight yarn. I had 1.8 ounces of yarn and my knitting is dead on gauge. But there you have it, the picture doesn't lie. I'm on the brink of running out. Is there more yarn you ask? Surely you have more? But I don't. I received the skein in a trade with another knitter years ago, and it was labeled as a "test skein." I dyed it myself. I've tracked down the "today version" of this supplier's DK weight merino yarn and have a couple of skeins headed my way, but I'm concerned that it won't be the same yarn. And although I'm confident I can dye something close, I'm equally sure that in the way of all hand-dyed yarn, it won't be a perfect match. I'm hoping both the yarn and the dyeing will be close enough, but I have that doomed feeling. It's not the end of the world, right? This is a simple pattern — you could knit up a pair in a day of serious knitting. But I'm quite attached to both this yarn and to these mitts. 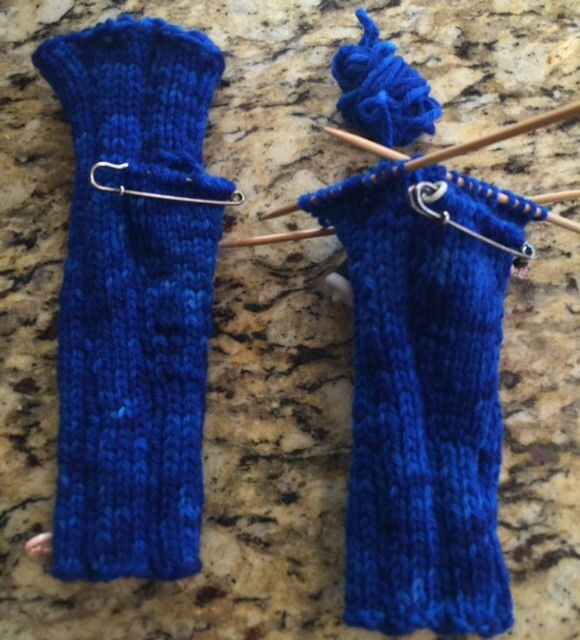 As cooler days have descended over the last week, I kept trying them on in progress and thinking about how warm and snuggly my hands would be once they were finished. Apparently, it's not meant to be. ← Postponed Knitting: Is It A Match Or Not? I really do understand your frustration. Good luck with the new yarn. Oh no! I’m so sorry Joyce. How frustrating :/ If it makes you feel any better, I’m having a not so lucky day today as well. My kids have been super cranky and challenging today and my son dropped a glass bowl on my extra special Mexican pottery bowl that I picked up in Mexico on our anniversary cruise this spring, breaking both of them. And now I’m terrified to pick up the WHITE sweater that I am knitting to go with a friend’s wedding dress as it is nearly completed and we haven’t had any accidents with it yet. If there were gonna be one, today would be the day. But I so badly need to complete it. The wedding is a little over a week away and I still need to block it and check sizing on her and all that. Just having one of those days where I want to go back to bed and start all over again…lol. I do hope that your dye job is a great match. If anyone could do it nearly perfectly it would be you! That’s a beautiful color. If anyone can dye another skein to match, it’s you! Thank you for the encouragement! Im in the middle of trying to do it now, so hopefully by the weekend Ill be back in business! Its really not that difficult. Some year well have to get all of the knitters/dyers who grew up on hyena cart together for a weekend retreat of dyeing and knitting! Sheesh… Wouldn’t that be a dream getaway! At least for this mama of five boys, nothing sounds better than a weekend of uninterrupted fiber fun. 🙂 Like a full project weekend where we all dye a beautiful skein of yarn, hang it out in the summer air to dry and then the next day sit around and chat while doing a one-skein knit-a-long. That sounds heavenly. We really should find a way to do it!